Grace In Our Moments: What Would You Have Left? Thank you for sharing! 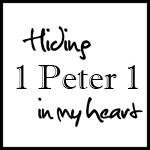 I loved your blog posts and your very practical teaching! I believe that I shall use your example tomorrow morning with my children as we begin "The Dig for Kids" and importance of memorizing Scripture as we go through. Great post. My family started saving His word in our hearts last year as part of our Bible study. Excellent, Amanda. I've had similar thoughts...what if the only knowledge available to me some day of the Bible was what I had memorized? Makes for additional motivation. So glad you're joining in memorizing with us!